"Great mold, lots of detail"
COMMENTS: I have been using this mold style for over 10 years now (original molds just now starting to break) and it has become my go to design for molded soaps. Classic design and it makes a medium sized bath bar that appeals to all. COMMENTS: love the mold. easy to use and clean. The design is eye appealing too. COMMENTS: This mold results in beautiful soap bar design. I used one color for the swirl design and another color for the remaining bar space. Beautiful. COMMENTS: Beautiful detail for cold process soap. The soap made with white (no colorants) gives a very classy look. Customers love it! COMMENTS: I first saw this mold used to make some soap, by a friend. She recommended this website, for a variety of different molds. I use my molds for making wax melts/tarts. This mold is the perfect size, shape, depth for me to make my melts, and hide a surprise inside them. I love the cute design, and my customers do too! COMMENTS: This mold really brings it! It's gorgeous with mica swirled in. The only problem you may have is that the results are so pretty, people may not use it! A little tricky to unmold, so I put it in the freezer for a bit, then they pop right out with gentle twisting. COMMENTS: So, very glad that I bought this mold and it is so pretty--Nice hand size, and super easy to unmold. I just soaped using this mold and I am happy that I bought this mold. I will buy more. COMMENTS: This makes a great soap- easy to unmold after popping in the freezer for 20 minutes when firm! The soap design is unique with the swirls, not too feminine for a guy to use so it can be universally a soap design for everyone. COMMENTS: I bought this because it was the weight of bar I was looking for and this shape fits in the hand nicely. The bars came out easily. COMMENTS: This mold is just so so pretty! I love the look of the bar it puts out and the bars pop out easy enough. Plus, this makes for a nice size bar to be able to grip. I don't make soap bars to sell but at least I have something nice just in case they are requested. COMMENTS: One of the few non-silicone molds that I use. This makes a beautiful bar that is a nice weight and fits well in the hand. It has such a pretty, elegant design. Love it. COMMENTS: Once I got this mold I was unsure of how I would like it. After I got my first batch of soap out I really loved it. Not only did the soap turn out amazing it was easy to use and easy to unmold. COMMENTS: This mold makes a very pretty bar of soap that is easy to unmold. Great product. COMMENTS: Makes a beautiful bar of soap. The perfect size also. COMMENTS: This is a pretty mold, unfortunately, when I gave it to my customers, they didn't want to use it because it was so pretty! COMMENTS: I liked the design and the way my soaps looked. I had a problem with them warping on me and they would not stay level when I put them down on the counter to finish saponifying. i also had issues with people I gave them to not using them because they were so pretty. Started using the loaf molds. COMMENTS: The bar is fairly easy to release from the mold. I didn't have any difficulties with it at all! And it is very pretty! COMMENTS: Although I prefer silicone molds, this one worked just fine. Has a great shape. Looks great with clear, dyed glycerin soap base. COMMENTS: This is a great versatile mold. You can make soaps to look like fudge, caramel, or pie fillings. You could just make bar soaps as well. I will be buying more of these molds in the future. 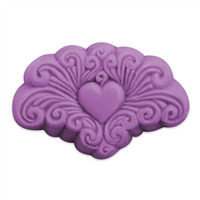 COMMENTS: Everytime I would shop for soap molds, my eyes were drawn to this mold-I finally ordered it and so glad I did! • easy to remove the soap. • Have to prop the mold so it is level. COMMENTS: This mold makes a beautiful soap that is a good size, and easy to pop out of the mold. Love it! "My favorite soap bar mold"
COMMENTS: This is a perfect mold and the end product is so lovely! I use this mold as an anchor piece in my bath & body baskets. I wish that it came in a tray style. Until it does I'll just have to buy more. COMMENTS: Makes very elegant bars of soap. I love it! COMMENTS: I used this mold for my first attempt at soap making, and I couldn't be more pleased. 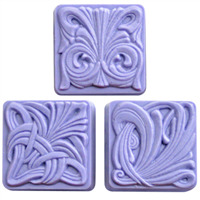 The soap bars look gorgeous, and this mold was very easy to use. I'm hooked! COMMENTS: Has a high class look and easy mold to release. Highly recommend it. COMMENTS: I am in love with this mold! The shape of the bar fits in the hand so nicely, and it's so pretty! The bars unmolded effortlessly, no fussing or freezing needed. I'll be using this one a lot! COMMENTS: I am ordering another one of these molds because I have so many requests for this mold, I can't keep up! It's my best selling mold! COMMENTS: Makes a soap that appears luxurious and expensive. I use it to make exfolianting soap bars that my customers RAVE about!! Unmolds easily, cleans up easy, nice size product, and makes a bar that's easy to hold onto in the shower - it's my favorite mold!! "What type of plastic are these molds made of? How thick is the plastic that is used for this mold? " Staff Answer Milky Way molds are made of PVC plastic. They are very sturdy and hold up to temperatures of 135°F.